Frances Tustin Today explores some of the ways and means by which Tustin’s work has enabled psychoanalytic clinicians to enter into the elemental domain of sensation: what Bion called the ‘proto-mental’ area of the psyche-soma. Through detailed clinical contributions of several of her exponents worldwide, this book demonstrates how her ideas -- rooted in decades of work with children on the autistic spectrum -- have influenced and are being expanded, extended and applied to the treatment of ordinary patients from early childhood through adulthood. The contributors to this volume represent a selection of the contemporary thinking that organically grew out of Tustin’s discoveries, and show that Tustin's model has added new dimensions to the fields of infant observation, family therapy and neuro-psychology. Each chapter is augmented by demonstrable clinical experience. 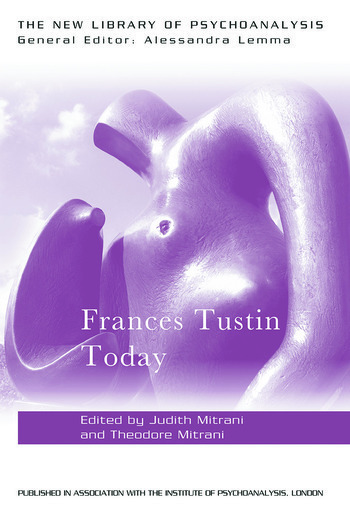 Frances Tustin Today is a valuable resource for psychoanalysts, psychotherapists, educators and parents who are interested in learning more about this uniquely independent clinical observer's findings and their impact upon the treatment of autistic states in children, adolescents and adults by contemporary workers in the field of mental health. Judith L. Mitrani, and Theodore Mitrani, are Fellows of The International Psycho-Analytical Association, Training and Supervising Psychoanalysts at The Psychoanalytic Center of California in Los Angeles. They are founding members of the Board of Trustees of The Frances Tustin Memorial Trust, and authors, editors, translators and teachers in the private practice of psychoanalysis and psychoanalytic therapy with Adults and Children in Los Angeles, California. Part II – Adolescence Through Adulthood. The use of observation in the psychoanalytic treatment of a 12-year-old boy with Asperger's syndrome by Maria Pozzi . Aspects of The Body Image and Sense of Identity In an Adolescent Boy with Autism: Implications for Eating Disorders by Maria Rhode. Long-Term Mother-Child Psychotherapy: Infantile Autism with Cerebellar Anomaly by Bianca Lechevalier. Autistic Phenomena in Neurotic Patients by Sydney Klein. Precipitation Anxiety Precipitation AnxietyIn The Analysis of Adult Patients by Didier Houzel. On the Concept of an Autistic-Contiguous Position by Thomas Ogden. Trying to Enter the Long Black Branches: Some Technical Extensions for the Analysis of Autistic States in Adults by Judith Mitrani. Ghosts in the Swamp: Some Aspects of Splitting and Their Relationship to Parental Losses by Kate Barrows. Judith L. Mitrani and Theodore Mitrani are Fellows of the International Psychoanalytical Association, and training and supervising psychoanalysts at the Psychoanalytic Center of California in Los Angeles. They are founding members of the Board of Trustees of the Frances Tustin Memorial Trust, and authors, editors, translators and teachers in the private practice of psychoanalysis and psychoanalytic therapy with adults and children in Los Angeles, California.